Sponsored in the U.S. Senate in 2005, 2006, and 2007, by Wyoming’s late U.S. Senator, Craig Thomas, the National Day of the Cowboy is a day set aside to celebrate the contribution of the Cowboy and Cowgirl to America’s culture and heritage. This year the date is today, July 26th to celebrate the National Day of the Cowboy. 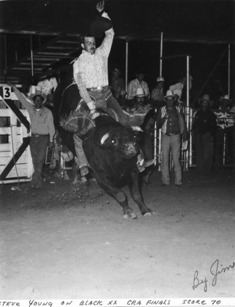 Two of my favorite memories are meeting Jim Shoulders who was the stock producer at my first RCA rodeo in 1971 and Freckles Brown who was judging a bull riding event I entered in 1972 in Ardmore Oklahoma which is believed to be the first standalone bull riding event of its kind. See also: National Day of the Cowboy, preserve the heritage and info on Lane Frost-Freckles Brown who are buried next to each other in Mount Olivet Cemetery~Hugo, OK.
Sure do appreciate each and everyone for coming out today and touring this wonderful hospital and allowing us to promote the CARA YOUNG FISH for LIFE Tournaments and benefit. Thanks to Karol Johnson and all the hospital staff for allowing us to tour and the great job you did. We saw a lot of the new additions that have been added to Cook Children’s just in the past few years and some information on up and coming additions as well. Sure do appreciate each and everyone for coming out today and touring this wonderful hospital and allowing us to promote the CARA YOUNG FISH for LIFE Tournaments and benefit. Thanks to Karol and all the hospital staff for allowing us to tour and the great job you did. Walton Group of Companies has purchased a large tract with plans to develop an 1,100-home master-planned community. The group bought 268 acres by Chisholm Trail Pkwy. and is currently in discussions with builders for the project in Chisholm Trail Ranch. Walton is also working with Crowley ISD on a planned elementary school site in the first phase of the community’s development. Plans are to begin delivering home lots by the end of 2015. BURLESON (Dallas Business Journal) – The H-E-B at 165 NW John Jones Dr. is undergoing a $14 million expansion that will increase the building’s size from 88,000 to 115,000 sf. It will become the DFW area’s first H-E-B Plus! store. Renovations began this month. Work is projected to be completed in February. The store first opened in 2010 and this is the only H-E-B Plus! planned in the area for the immediate future. Very proud of the City of Burleson and it’s leadership. For the fifth consecutive year, the City was awarded the Gold Leadership Award from the Texas Comptroller for transparency. Finance was honored with the Government Finance Officers Association’s Distinguished Budget Presentation Award for FY 2013. Welcome to the most current Housing Trends eNewsletter. This eNewsletter is specially designed with national and local housing information that you may find useful whether you’re in the market for a home, thinking about selling/leasing your home or property, or just interested in property owner issues in general.